Affectionately called “the season of rebirth,” spring is just the right time to revamp your home. Toss the old, welcome the new and bring order to chaos. We want to help you breathe life into your dwellings. So, we plucked the freshest bushel of home furnishing deals. And we want your hard-earned green to go far. So, we compared our rates with Rakuten’s/Ebates’. But before we dig in, let’s check out some handy shopping trends. According to the Bureau of Labor Statistics, the average 3-person household shells out $40.94 a week on home furniture, appliances, fittings and other decorative accessories. They cough up $177.42 a month and $2,129 per year. This is a lot of dough. $40.94 could fill up a gas tank. And $2,129 could go toward a much-needed vacay. But before you resort to garage sale hand-me-downs, check out our list of deals. They’ll keep your rooms full and wallet fat. Lowe’s is the mother of all things domestic. And they offer crazy-good discounts on the regular. Stack one of our promo codes on top of up to 4% cash back for a savings double whammy. The average 3-person family spends $2,129 annually on home furnishings. So, if they used our rate, they’d nab $85.16 for the whole year. If they settled for Rakuten/Ebates, they’d only get 1% cash back. So, they’d pocket just $21.29 for a year’s worth of purchases. If you’re hunting for sturdy furnishings with an artisanal flair, scope out Crate & Barrel. Their sofas, chairs and bookcases are exceptionally gorgeous. Shop till you drop with our 2% cash back. That’s $42.58 back per year. 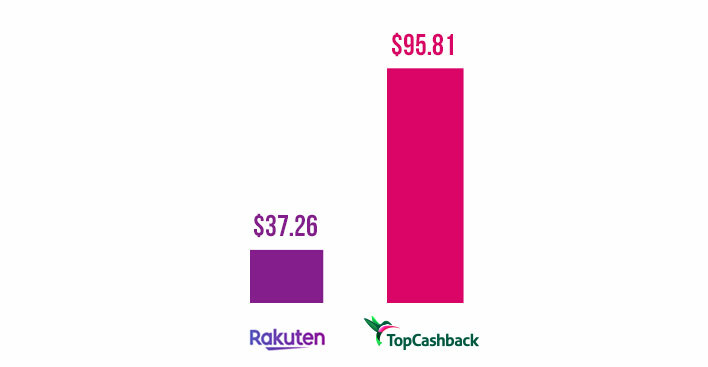 Use Rakuten/Ebates, and you’ll scrape up 1% cash back. Known for their fashion-forward trends and handcrafted merchandise, Pier 1 Imports is the kind of store you window-shop on your lunch break because it makes you feel good. Even if you can’t afford their treasures, you bask in the colorful, creative ambiance. We’ll, you don’t have to leave their site empty-handed with our 4% cash back. Go through Rakuten/Ebates, and you’ll nab 2% cash back. Whether you need seasonal trimmings or everyday fixtures, Overstock.com is the one-stop-shop for you. Go nuts with 5% cash back. That’s a whopping $106.45 back for 12 months. Make your purchase through Rakuten/Ebates, and you’ll receive 2.5% cash back. That’s just $53.23 for the year. Known for their energy-efficient appliances and cutting-edge tools, The Home Depot has an overwhelming amount of goodies for your humble abode. 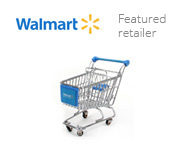 Fill up your cart through us, and you’ll snag up to 8% cash back. That’s $170.32 back for the year. Please keep in mind, this rate applies to flooring solutions, small appliances, home décor, tabletop & bar, wall décor, luggage, kitchen carts, cookware sets, textiles and interior furniture only. Go through Rakuten/Ebates, and you’ll come up short. 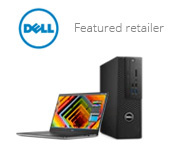 Because they don’t offer cash back for this can’t-live-without store. Year's worth of cash back if you shop at Lowe's and Overstock.com for 6 months each. These are just a few home furnishing stores. If you’re not sure which you like best, try one for 6 months and another for the rest of the year. So, say you shop at Lowe’s for 6 months, you’ll get $42.58 cash back. And if you spend the rest of the year at Overstock.com, you’ll snag $53.23. That’s $95.81 for all 12 months if you combine 6 months’ worth of cash back from each store. 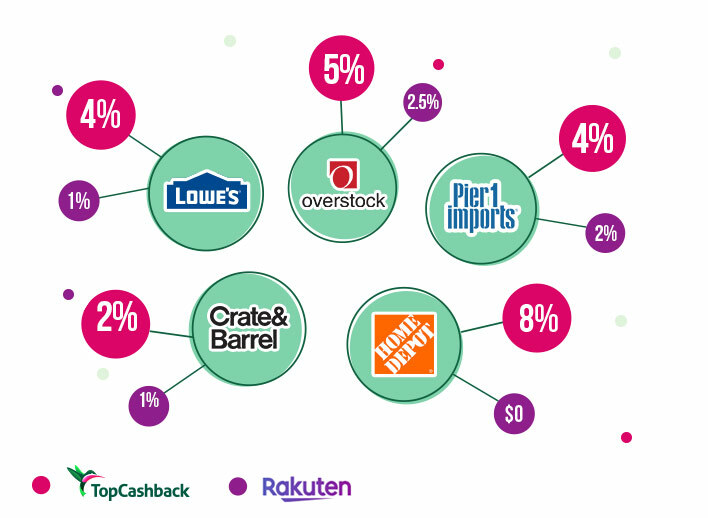 If you go through Rakuten/Ebates, you’ll earn $10.65 cash back at Lowe’s for 6 months of merchandise. And you’ll walk away with $26.61 if you scoop up Overstock.com products for the rest of the year. That’s only $37.26 cash back for 12 months. If you’re interested in the other differences between us and Rakuten/Ebates, check out our nifty guide. You can learn about payout options, restrictions, cash back guarantees and more. Yeah if the stores actually gave you the cashback instead of claiming you had an "invalid order number" or "used a coupon" or whatever they wanted when you didn't do any of those things. Doesn't matter if you have the highest percent if the stores don't pay it.